I have absolutely no problems with anyone also attempting longs from the low of this range. In hindsight, they provide great opportunity. While live though, I was biased more short only due to higher timeframes, so limited myself to that one direction only. awesome article, as usual! 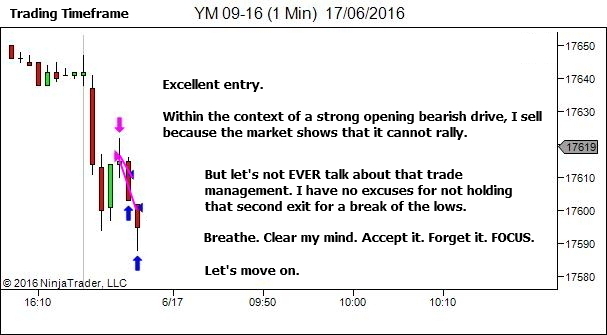 Could you comment just a bit more on your trading bias during that sequence of trades? Basically, given the price action after your second trade, it looked like there was a solid support forming in the 17600 area, with a possible TST setup on the higher time frame. With that said, I will quickly add that *there is no way* that I would be able to do that, i.e. 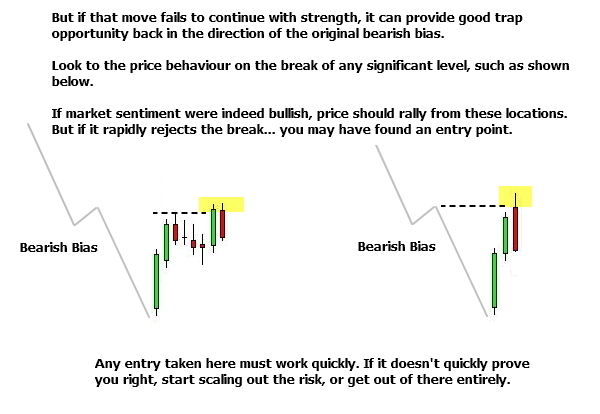 change my trading bias to long while trying to find an entry short – especially after one or two successful short trades! 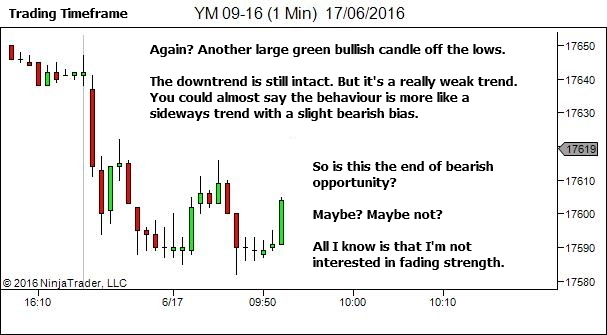 Did you see something, after your second trade, that made you keep your trading bias unchanged? 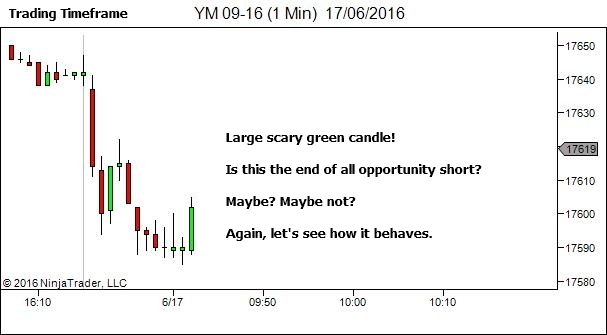 Phrased differently: what would you have to see, in order to start going long rather than short? Yes, support was forming in the 17590/17600 area. 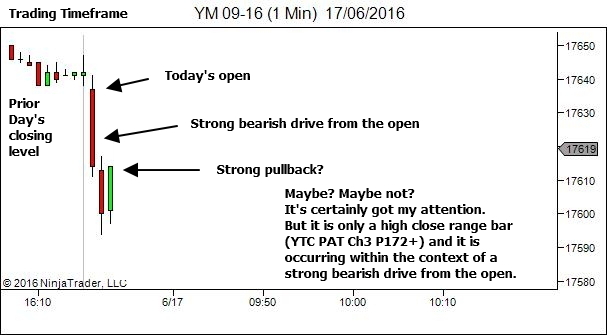 And ideally I “should” have been more accepting of this information and able to flip my bias from short to long. The issue I guess is not so much of a technical nature. It’s more psychological. From a technical perspective, the prior day was a strong uptrend through most of the session (stalling just for the last hour). Importantly though, it brought price right to an area where it had previously dropped sharply lower. 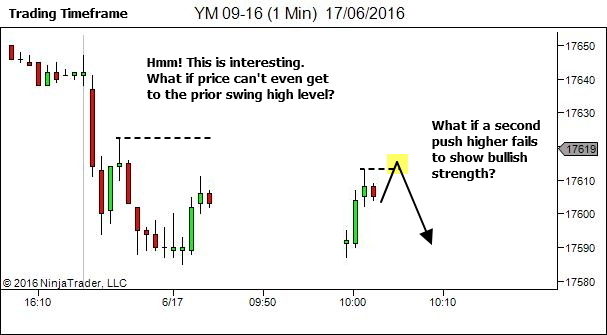 So when the overnight action was unable to continue the uptrend, and the session open pushed strongly downwards, I developed a belief that price could continue this downwards momentum. Ultimately it did move lower, but the move didn’t happen till about an hour later. So while the technicals supported a potential bearish bias, the real issue in not flipping to “long” after the second trade found support was more of a mindset issue. I had a strong belief that if price could break the lows it would fall hard. There is nothing wrong with having a belief about price direction, PROVIDED we’re able to drop that belief quickly when price movement doesn’t support it any longer. I dropped the belief, but it took a bit longer than it ideally should have. But that’s trading… learning to profit over a larger sample of trades despite the imperfection of our decision making. Wow what an article, it is awesome! Thank you for this very detailed explanation with charts, I love it. Once again (propably as always 🙂 great article. 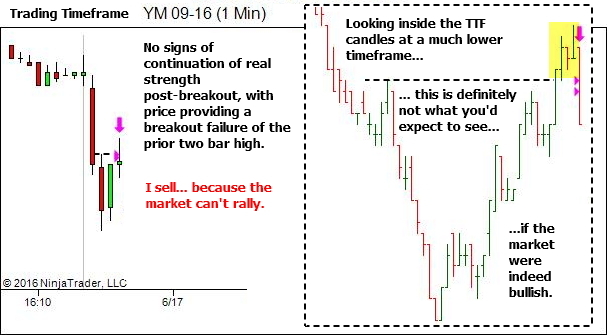 I admire your timing for this pullbacks. But I’m curious where and why you left on your way scalping channel? If you already wrote about it, please let me know and I ‘ll try to find it. Happy trading and more days like this! 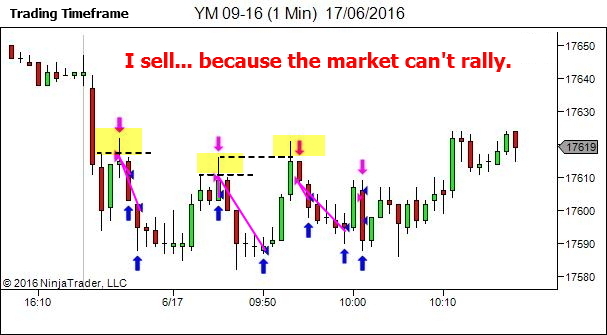 Are you asking why I’m not using the scalping channel? I do. 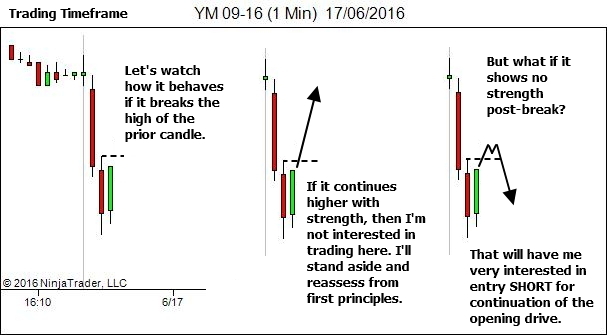 I operate with two lower timeframe charts; one being the YTC Scalper range bar channel and the other being a time or tick chart. At times each can give a different perspective. 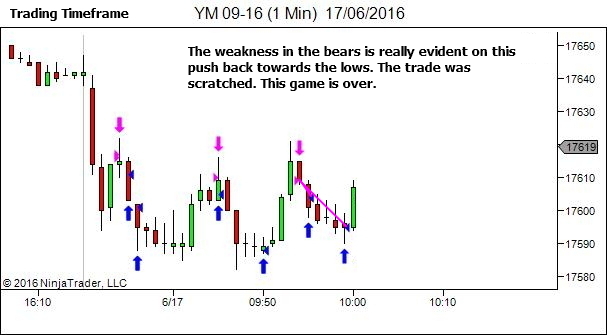 I more often than not don’t share the scalper channel charts through the newsletter, as very few people have that ebook. I’m not sure why that is??? 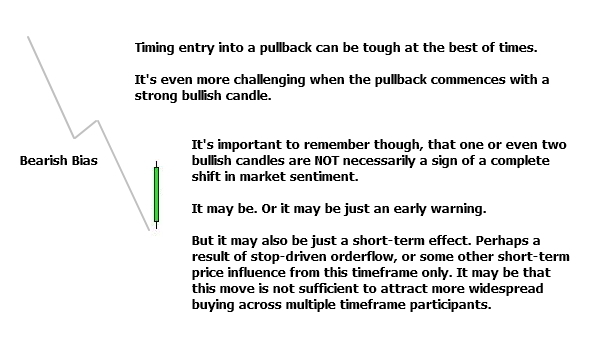 Yes, there will be times when you enter on signs of weakness only to find the pullback continuing against your trade. This cannot be prevented completely. 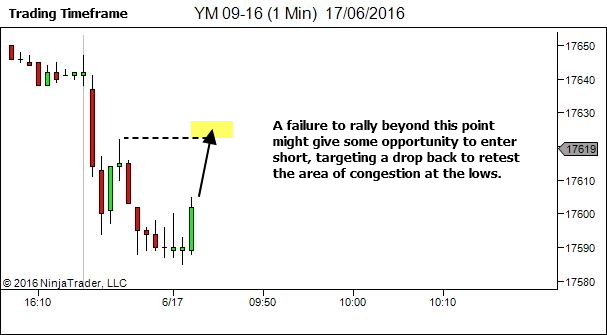 Hence the importance of our stop loss to contain damage to manageable levels. At times though you will be able to scratch the position before the stop is hit; sometimes for a small profit, other times for a smaller loss. Largely it is a result of judgement and intuition. If price does not move in the expected direction, within the expected “normal amount of time”, then something is not right. You need to reassess. Perhaps you’ll still hold and give the trade further time. But often, if it’s not moving as expected, the better option is to get out. Scratch the trade. And then reassess again from the sidelines with a more objective mind. in the second-last image on this page, you have shown yellow shaded areas as entry points. Do you mean that after the strong rejection from that area (the last red candle), you wait for a retest of that area and short? Or is it that you see the weakness in lower TF and short while that red candle rejection is forming? This is correct. I’m looking within these shaded areas for an inability to continue higher. 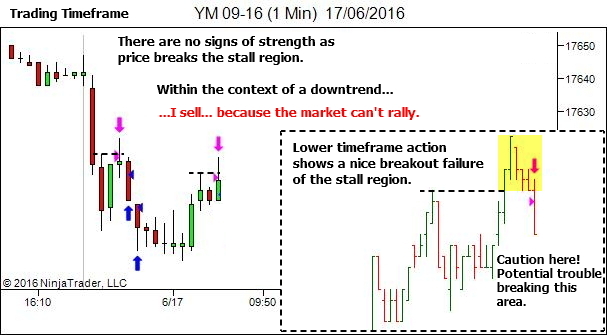 This will show on the lower timeframe as some form of weakness / stall / rejection. 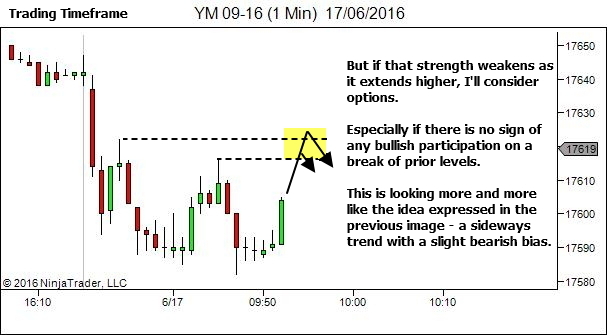 Of course, if you are unable to capture an entry for any reason you can always seek entry on a retest of the area, as you suggested. this question is not regarding any particular post, but a general question. In most of your posts, i dont see any mention to LWP. May i know the reason? I am very sorry if I asked something that i wasnt supposed to. As it is, you are doing so much for us newbies. Yes sir, I’ll add to that by saying that these news letters are gold and I am both surprised and admire the fact that they are a free subscription. They greatly complement both books. Also I have a theory if I may as to why the scalper book hasn’t sold as many copies. I believe it is because most folks find a TTF of 5 min plenty fast. 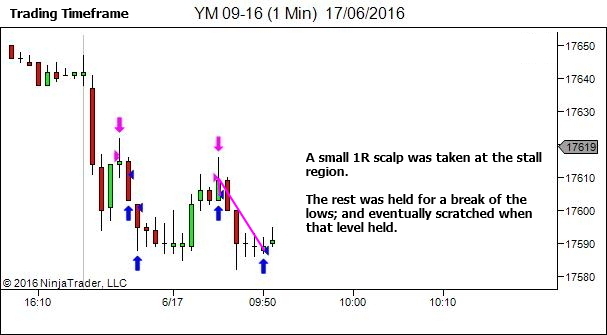 I only started exploring 1 min TTF after becoming comfortable with the PAT concept on the 5 min TTF. After a while I started taking sloppy entries due to boredom and a need to get in and practice my management of trades more which is what eventually brought me to the scalper book, after I noticed a dip in my usual breakeven results. I must say that the tweaks to the original strategy in that book are very worth looking at for people happy on the 5 min ttf aswell. Lastly we must consider those that end up quitting when it turns out the learning curve is longer then meets the eye. Anyway, thank you Mr Beggs for a great site in general. Thanks! And I agree entirely. 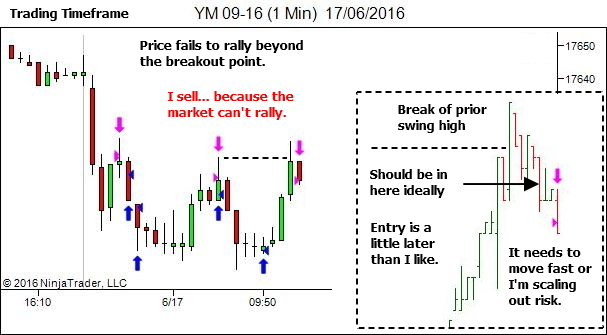 It’s essential to be comfortable on the 5 or 3 min timeframe, with the original strategy, before exploring quicker timeframes. You need to be comfortable with the process before speeding it up.